“I am organizing the local players join this sport in South China right now. 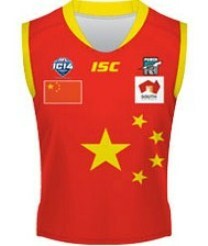 We join the SCAFL which includes Hong Kong , Macau and Guang Dong players. Also we have another local league called GDAFL which include GuangZhou, HuiZhou and DongGuan. There are about 100 players. Our team still have a long way to travel. I hope I can help the China team to be better in the future. I also hope I can help AFL to find some potential players in China.” “I suggest that the AFL can use IC11 method to have the seeding round game. It is very difficult for the development team to play against the strong team. I hope more clubs can build more cooperation with China player. Maybe the clubs can choose some potential players to go to Australia for training and study. Zhang and his team can be proud of their efforts to not only grow the game in China, but to take to the fields of battle at the International Cup and win against Finland as well as a narrow defeat to Japan. We wish them the best of luck for the future.